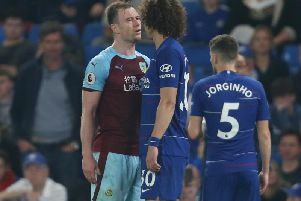 Sean Dyche insists Premier League survival remains the first aim next season, despite a campaign which has delivered a best top-flight finish since 1974 and European football. The Clarets guaranteed seventh place last weekend, with two games to spare, and a return to continental competition after a 51-year absence. Dyche has delivered two promotions and two record campaigns in the Premier League - staying up at yeh club’s third time of asking with 40 points, before kicking on, and some, this season. However, he notes the example of relegated West Brom and Stoke - both relatively established at this level - as he looked at the ambition for next term: “The immediate one is still Premier League status, we can’t go away from that. We’ve seen that this season, the chaos of the division. We all know where the top six are, and it’s not impossible, as Leicester have shown, but improbable that will radically change, because of their buying power and the power of the clubs. “Outside of that, relative chaos. Maybe people could argue Swansea after selling some good players, that could happen, with everyone sat thinking who it could happen to - and people would have put us in that category. “I don’t think West Brom and Stoke were in that category, and the others, West Ham and Palace fighting around there, it’s really tough. “11th is like 41 points - that’s unheard of for so many teams to be battling to get 40 points. “That proves how difficult it is becoming. The first marker for probably 14, apart from that top group and Everton historically, is 40 points. Everyone else, let’s try and form a team and get to 40 points, and then, where can we take it? “This season was slightly different, can we go better than 40 points? Then can we move it forward from there? “Then we start again. It’s not a goal, it’s the first challenge, a marker. If you get there, the. You open your minds and see where we can take it, and we’ve taken it a long way. “It doesn’t guarantee next season though, we’ve already had the chat with the players. We start again and have to move forward again. Bettering this season will be a tough task in terms of league placing and points tally, with the big 6 almost untouchable, but Dyche is up for the job: “That’s the challenge. The challenge of relative failure is easier because you have to do better, if you stay in your job. “Whatever you do, the next story, the next opinion, is waiting. The usual question about the expectation levels. “Football waits for no one. “After promotion, I said, give me one day. Then I asked for two, before the negative stories start. “The Europa thing, people were negative before we even got there.